Inelastic neutron scattering experiments reveal that the effective magnetic exchange couplings in NaFeAs are smaller and more isotropic than those in the heavily studied AFe2As2 family. 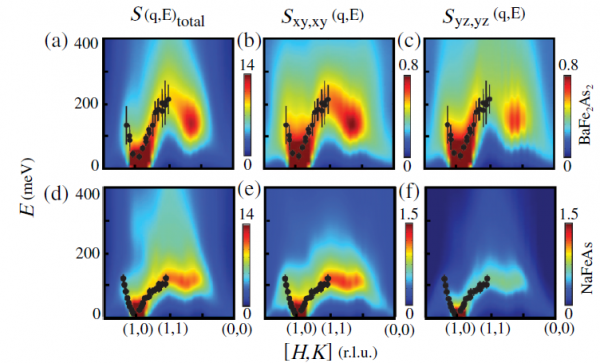 These results provide evidence that the energy scale of the magnetic excitations, which are thought to influence the superconducting transition temperature, is controlled by the position of As atoms above the Fe layers. Spin waves, measured using the ARCS chopper spectrometer at SNS, were studied in the antiferromagnetic ordered phase of NaFeAs, the parent compound of NaFe1−x CoxAs family of iron pnictide superconductors. NaFeAs was chosen because it has weak AF ordered moment, low superconducting transition temperature, and large As height, significantly different from AFe2As2.